Definition at line 119 of file LoopVectorize.h. Definition at line 128 of file LoopVectorize.h. Definition at line 7212 of file LoopVectorize.cpp. References llvm::InnerLoopVectorizer::AA, llvm::InnerLoopVectorizer::AC, AddRuntimeUnrollDisableMetaData(), llvm::InnerLoopVectorizer::areSafetyChecksAdded(), assert(), llvm::AMDGPUISD::BFI, llvm::LoopVectorizationLegality::canVectorize(), llvm::LoopVectorizationCostModel::collectValuesToIgnore(), llvm::VectorizationFactor::Cost, llvm::createLVMissedAnalysis(), llvm::dbgs(), llvm::VectorizationFactor::Disabled(), llvm::LoopVectorizationRequirements::doesNotMeet(), llvm::InnerLoopVectorizer::DT, llvm::OptimizationRemarkEmitter::emit(), llvm::LoopBase< BlockT, LoopT >::empty(), llvm::TargetTransformInfo::enableInterleavedAccessVectorization(), EnableInterleavedMemAccesses, EnableVPlanNativePath, llvm::LoopVectorizationPlanner::executePlan(), F(), llvm::LoopVectorizeHints::FK_Disabled, llvm::LoopVectorizeHints::FK_Enabled, getDebugLocString(), llvm::LoopBase< BlockT, LoopT >::getHeader(), llvm::LoopVectorizationLegality::getLAI(), llvm::getLoopEstimatedTripCount(), llvm::Loop::getLoopID(), llvm::Value::getName(), llvm::BasicBlock::getParent(), llvm::Loop::getStartLoc(), llvm::Optional< T >::getValue(), llvm::APInt::getZExtValue(), llvm::Optional< T >::hasValue(), llvm::TargetTransformInfo::isFPVectorizationPotentiallyUnsafe(), llvm::InnerLoopVectorizer::LI, LLVM_DEBUG, LLVMLoopVectorizeFollowupAll, LoopVectorizeWithBlockFrequency, LV_NAME, llvm::makeFollowupLoopID(), llvm::max(), llvm::InnerLoopVectorizer::ORE, llvm::LoopVectorizationPlanner::plan(), processLoopInVPlanNativePath(), llvm::InnerLoopVectorizer::PSE, llvm::LoopVectorizationCostModel::selectInterleaveCount(), llvm::LoopVectorizationPlanner::setBestPlan(), llvm::Loop::setLoopID(), llvm::shouldOptimizeForSize(), TinyTripCountVectorThreshold, llvm::InnerLoopVectorizer::TLI, llvm::InnerLoopVectorizer::TTI, llvm::APInt::ult(), useMaskedInterleavedAccesses(), llvm::verifyFunction(), and llvm::VectorizationFactor::Width. Definition at line 7604 of file LoopVectorize.cpp. References llvm::InnerLoopVectorizer::AA, llvm::InnerLoopVectorizer::AC, llvm::PreservedAnalyses::all(), llvm::AMDGPUISD::BFI, llvm::InnerLoopVectorizer::DT, llvm::EnableMSSALoopDependency, EnableVPlanNativePath, F(), llvm::AnalysisManager< IRUnitT, ExtraArgTs >::getCachedResult(), llvm::GlobalValue::getParent(), llvm::AnalysisManager< IRUnitT, ExtraArgTs >::getResult(), llvm::InnerLoopVectorizer::LI, llvm::InnerLoopVectorizer::ORE, llvm::PreservedAnalyses::preserve(), runImpl(), llvm::InnerLoopVectorizer::TLI, and llvm::InnerLoopVectorizer::TTI. Definition at line 7540 of file LoopVectorize.cpp. References llvm::InnerLoopVectorizer::AA, llvm::InnerLoopVectorizer::AC, llvm::AMDGPUISD::BFI, collectSupportedLoops(), llvm::InnerLoopVectorizer::DT, llvm::SmallVectorBase::empty(), llvm::formLCSSARecursively(), llvm::TargetTransformInfo::getMaxInterleaveFactor(), llvm::TargetTransformInfo::getNumberOfRegisters(), llvm::InnerLoopVectorizer::LI, llvm::InnerLoopVectorizer::ORE, llvm::SmallVectorImpl< T >::pop_back_val(), llvm::simplifyLoop(), llvm::SmallVectorBase::size(), llvm::InnerLoopVectorizer::TLI, and llvm::InnerLoopVectorizer::TTI. Definition at line 139 of file LoopVectorize.h. Definition at line 140 of file LoopVectorize.h. Definition at line 136 of file LoopVectorize.h. Definition at line 138 of file LoopVectorize.h. Definition at line 135 of file LoopVectorize.h. Definition at line 141 of file LoopVectorize.h. If false, consider all loops for interleaving. If true, only loops that explicitly request interleaving are considered. Definition at line 122 of file LoopVectorize.h. Definition at line 133 of file LoopVectorize.h. Definition at line 142 of file LoopVectorize.h. Definition at line 143 of file LoopVectorize.h. Definition at line 132 of file LoopVectorize.h. Definition at line 137 of file LoopVectorize.h. Definition at line 134 of file LoopVectorize.h. 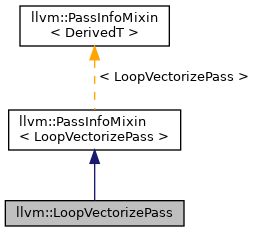 If false, consider all loops for vectorization. If true, only loops that explicitly request vectorization are considered. Definition at line 126 of file LoopVectorize.h.